Use a cleanser on the nails to clean and temporarily dehydrate the nail plate surface before application to ensure there are no oils that can lead to peeling. 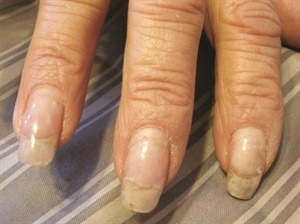 Soaking fingernails in a dish of water before polish application can lead to the entire application peeling off or the edges quickly chipping. Do meticulous cuticle work on the entire nail plate for a first-time client and in the full regrowth area of a return client. Leaving cuticle (the transparent tissue that grows out with the nail plate) behind will prevent adhesion of the product to the nail plate. 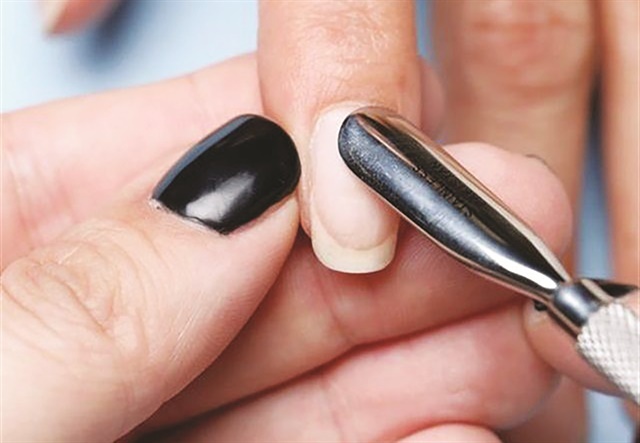 Avoid touching the skin with the polish, leaving a small perimeter around the nail away from the skin. When sealing the free edge, make sure not to get polish on the fingertip or hyponychium. Indentations in the polish after a few hours may occur when the color and/or top coat are applied too thickly. 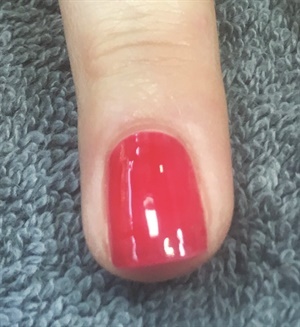 Polish in thin even layers, leaving 60 seconds between layers to make it more likely you will have a full hardening of the polish in the manufacturer’s suggested time frame. Sometimes you can polish so fast that the solvents are still trying to escape when you apply the top coat. Waiting about 60 seconds between polish layers as well as before applying the top coat can make it less likely you will have bubbles in the top coat application. Apply the layers of color and top coat using a minimal number of strokes. Going back through the polish multiple times may cause bubbles in addition to streaks. Polish should be applied in thin layers to allow it to wear longer and dry faster. Two thin layers will give you better coverage and wear time than one thick layer. 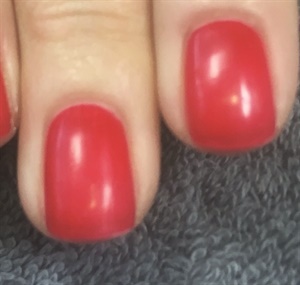 If a polish color has not been used in a while, you may need to mix or shake it to redistribute the pigment amongst the solvents and achieve optimal color. Thickly applied top coat may result in a loss of shine. 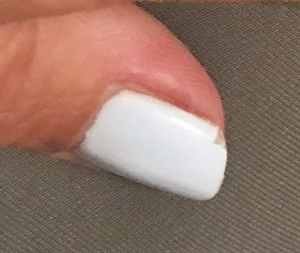 Soaking fingernails in a dish of water before gel-polish application can lead to the entire application peeling off or the edges quickly chipping. Use the lamp designed for the system you choose to use. A reputable, professional nail company will have calibrated their lamp to properly cure the systems they release. Not only will this prevent peeling or chipping, it will also deter overexposure and allergic reactions. Recommend home care that includes a daily oil in addition to wearing gloves when doing any cleaning, including using simple household wipes. Clients should also avoid getting face creams and sunscreen on the nails. It is important to seal the edge of the nail with each layer of gel-polish from base coat to the first layer of color to top coat. Recommend protective home care like wearing gloves for cleaning, gardening, etc. Applying gel-polish too thickly will lead to wrinkling when it cures. Using a lamp that is not designed to cure the system you use may cause wrinkles due to the incorrect cure. Applying gel-polish too thickly will prevent a proper cure and diminish shine. Using an isopropyl alcohol that’s less than 99% pure may lead to some of the top film or tacky layer being left behind and causing dullness. 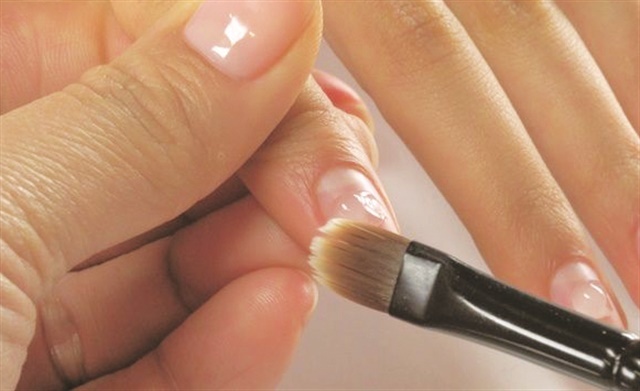 Use a cleanser on the nails to clean and temporarily dehydrate the nail plate surface before application to ensure there are no oils that can lead to lifting. Use the lamp designed for the system you choose to use. A reputable, professional nail company will have calibrated their lamp to properly cure the systems they release. Not only will this prevent lifting, it will also deter overexposure and allergic reactions. 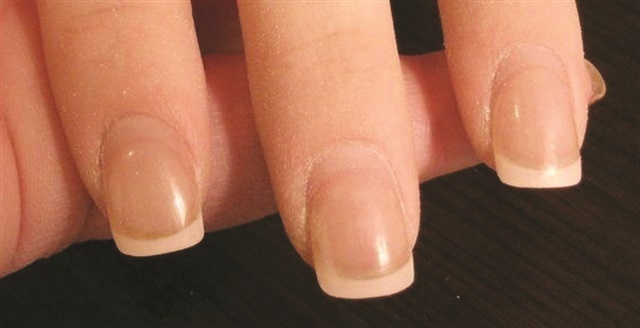 Some clients’ lifestyles may require that the extended length of the nail not exceed half the length of the nail bed for balance and strength. Nail enhancements need an arch sculpted in to absorb the shock of everyday life. The stress area is generally the center of the enhancement (from eponychium to extension edge). An arch will give the nail more strength. Recommend a length and shape appropriate to the client’s lifestyle. Helping them choose a length and shape ideal for their work and non-work activities will make stress cracks much less likely to form. Work with deliberate intent. Overworking the gel when trying to move it into place will whip bubbles into it that are difficult to remove. Most gels will self-level if you gently guide them into place, versus frantically trying to push and pull them around. Shaking or stirring a jar of gel aggressively will cause bubbles to form that may not settle out. If you need to blend or mix a gel, use slow motions to avoid forming bubbles. An arch will give the nail more strength (see Stress Cracks above). An even C-curve in the nail from one side to the other can make breaking less likely. Having one side a little thicker increases the chances that you have a break down the center of the nail or lose a corner completely. Applying the product too wet will lead to lifting with the potential of overexposure. Touching the skin with your brush or product during application may lead to lifting. Nails must be gently buffed to remove the surface shine before application; leaving the shine behind can cause lifting. Nails must be gently buffed to remove the surface shine before application; leaving the shine behind can cause pocket lifting. Tips that are not properly prepped and blended may have pocket lifting. Tip adhesive remaining on the nail plate could lead to pocket lifting. Inconsistent mix ratio will lead to breaking. Drastic temperature change can cause breakage. Clients should leave the salon with gloves on in cold temperatures. Lack of an arch sculpted into the nail will lead to cracks and breaks. Enhancements require home care. A quality nail oil applied daily should keep the natural nails from becoming dry and curling away from the extension edge. Incorrect mix ratio will cause the product to have a marbled look to the color. Expired or low-quality liquid or powder may yellow. Contaminated nail brushes or product will cause yellowing. Do NOT overuse the sculpting liquid. One sign you are using too much is consistent heat spikes (exothermic reaction). Too much liquid in the brush floods the nail and limits adhesion. For good adhesion, you need to work with the product using the pressure you are used to having with liquid and powder, versus the soft glide used with most hard gels. Use the lamp designed for the system you choose to use. A reputable, professional nail company will have calibrated their lamp to properly cure the systems that they release. Not only will this prevent lifting, it will also deter overexposure and allergic reactions. Too much liquid in the brush floods the nail and the sculpting liquid can actually cause cracking in poor-quality tips. Make sure you build a proper apex for strength. Pressing too heavily on the sides can thin out the stress area, which can lead to cracking. 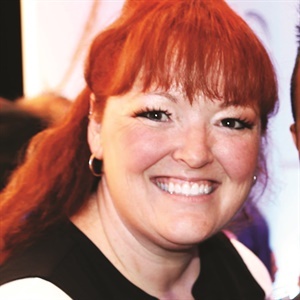 Holly Schippers is a contributing editor to NAILS and a member of Team CND. Follow her FingerNailFixer blog on www.nailsmag.com.